Romanesque Architecture is an architectural style of medieval Europe characterized by semi-circular arches. There is no consensus for the beginning date of the Romanesque style, with proposals ranging from the 6th to the late 10th century, this later date being the most commonly held. It developed in the 12th century into the Gothic style, marked by pointed arches. 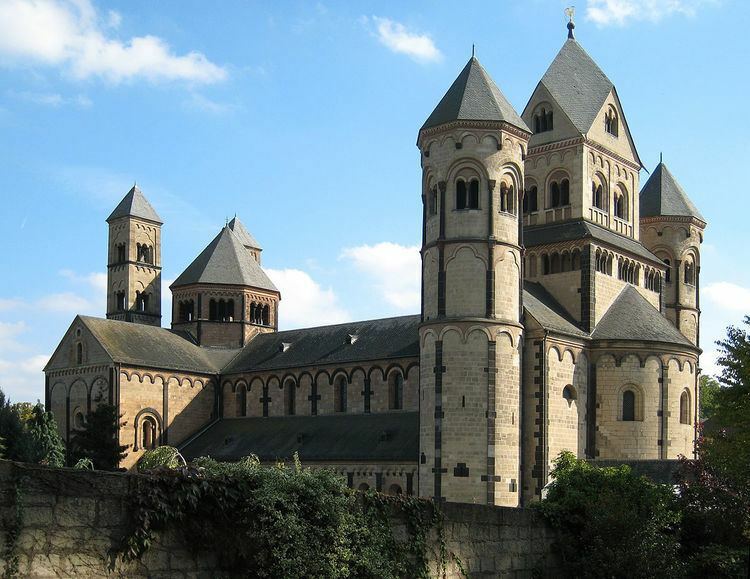 Examples of Romanesque architecture can be found across the continent, making it the first pan-European architectural style since Imperial Roman Architecture. The Romanesque style in England is traditionally referred to as Norman architecture. Combining features of ancient Roman and Byzantine buildings and other local traditions, Romanesque architecture is known by its massive quality, thick walls, round arches, sturdy pillars, groin vaults, large towers and decorative arcading. Each building has clearly defined forms, frequently of very regular, symmetrical plan; the overall appearance is one of simplicity when compared with the Gothic buildings that were to follow. The style can be identified right across Europe, despite regional characteristics and different materials. The name Roman (esque) we give to this architecture, which should be universal as it is the same everywhere with slight local differences, also has the merit of indicating its origin and is not new since it is used already to describe the language of the same period. Romance language is not degenerated Latin language. Latin language is degenerated Romance language. Romanesque architecture is not debased Roman architecture. Roman architecture is debased Romanesque architecture. The structure of large churches differed regionally and developed across the centuries. The use of piers of rectangular plan to support arcades was common, as at Mainz Cathedral and St Gertrude Nivelle, and remained usual in smaller churches across Europe, with the arcades often taking the form of openings through the surface of a wall. In Italy, where there was a strong tradition of using marble columns, complete with capital, base and abacus, this remained prevalent, often reusing existent ancient columns, as at San Miniato al Monte. A number of 11th-century churches have naves distinguished by huge circular columns with no clerestory, or a very small one as at St Philibert, Tournus. In England stout columns of large diameter supported decorated arches, gallery and clerestory, as at the nave of Malmesbury Abbey (see "Piers and columns", above). By the early 12th century composite piers had evolved, in which the attached shafts swept upward to a ribbed vault or were continued into the mouldings of the arcade, as at Vézelay Abbey, Saint-Étienne, Caen, and Peterborough Cathedral. The nature of the internal roofing varied greatly, from open timber roofs, and wooden ceilings of different types, which remained common in smaller churches, to simple barrel vaults and groin vaults and increasingly to the use of ribbed vaults in the late 11th and 12th centuries, which were to become a common feature of larger abbey churches and cathedrals. A number of Romanesque churches are roofed with a series of Domes. At Fontevrault Abbey the nave is covered by four domes, while at the Church of Saint Front, Périgueux, the church is of Greek cross plan, with a central dome surrounded by four smaller domes over the nave, chancel and transepts.